Espresso Chocolate-Chip Coffee Cake • Spelt Jam Thumbprint Cookies Vanilla Bean Cupcakes • Creamy Dreamy Lemon Mousse Pie • White Balsamic Fruit Tarts with Jam Glaze • Chai Chocolate Mini Loaves • Poppy Seed and Raspberry Muffins • Rocky Road Brownies, and more! 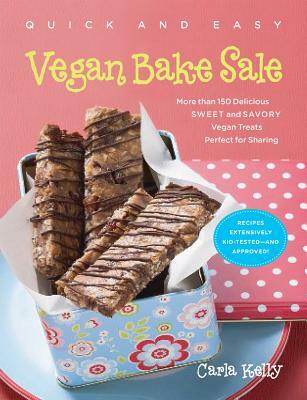 Carla Kelly, the talented mom behind the popular blog The Year of the Vegan, spills all her secrets on how to hold a great bake sale—with crowd-pleasing treats that are easy to store, transport, and share. Beginning bakers will love her tips on key techniques, must-have utensils, and how to “troubleshoot” baking gone wrong. And a helpful glossary of wheat-free, nut-free, and soy-free options ensures that everyone can join the party. Chocolate ganache . . . blueberry cream . . . homemade marzipan . . . after one bite, vegans and nonvegans alike will be too busy enjoying fantastic flavor to even think of missing milk, eggs, or butter. And since it’s all quick and easy to make, you definitely won’t be too busy to bake your cake—and eat it too! CARLA KELLY is an experienced cook and baker, having started well before the age of ten. As the eldest of five children, she often made baked treats and dinner for her family. She has been a vegan for over sevenyears and a vegetarian for fifteen more before that, and has developed recipes to suit herself and her family on this journey. She writes the popular blog The Year of the Vegan (VeganYear.blogspot.com) and lives in British Columbia with her family.